WASHINGTON (CNS) — The Freedom of Religion Act, introduced Jan. 16 in the House of Representatives, would — if enacted in its current form — ban religious discrimination in the U.S. immigration system. A similar bill was introduced in 2016 as a reaction to then-candidate, now-President Donald Trump’s call for a “Muslim ban” for immigration to the United States. Trump’s third try at an executive order, issued in September 2017 and which banned entry to immigrants from eight countries — five of which are predominantly Muslim — was upheld last June by a 5-4 vote of the U.S. Supreme Court. Trump’s first travel ban, issued right after he took office, was blocked by several U.S. courts. A few months later, a second version of the ban was similarly blocked by several lower courts. “We prioritized introducing this legislation because portions of President Trump’s Muslim ban remain in force and are at odds with American values and principles,” said a Jan. 16 statement by Rep. Don Beyer, D-Virginia, who introduced both the 2019 and 2016 bills. “We are at a turning point in our history. 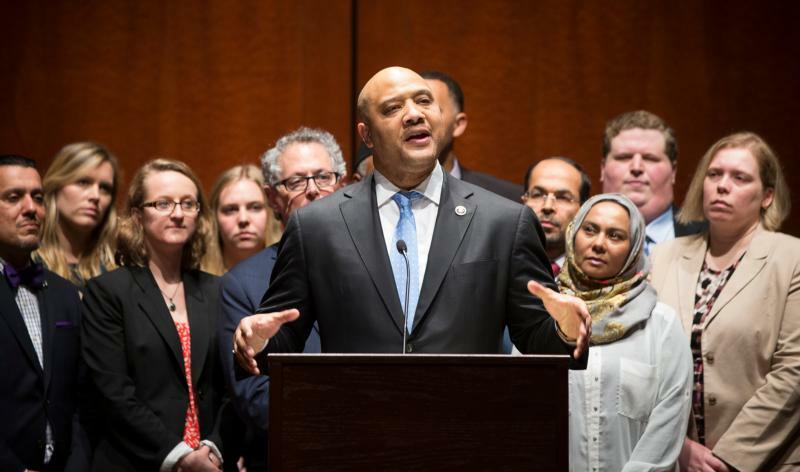 We must decide whether we stand for liberty and equality or oppression and bigotry,” said a Jan. 16 statement from Rep. Ilhan Omar, D-Minnesota, one of two first-term Muslim women in the House. “As a daughter of immigrants and a proud Jew, I will never forget where my family came from or the horrors that members of my community have experienced,” said a Jan. 16 statement from Rep. Jan Schakowsky, D-Illinois. Chief Justice John Roberts issued the Supreme Court’s June ruling on on the ban, supported by Justices Anthony Kennedy, Clarence Thomas, Samuel Alito and Neil Gorsuch. It said the president’s proclamation is “squarely within the scope of presidential authority” under the Immigration and Nationality Act.